I love a good Reuben sandwich, piled high with tender corned beef, Swiss cheese, crispy sauerkraut and tangy mustard or Thousand Island dressing, served grilled on fresh rye bread. It’s usually one of my go-to sandwiches whenever I’m in a New York-style deli. Many delis have tried to lighten up this classic by replacing the corned beef with lean turkey and using reduced-fat dressing and cheese. And I’ve found many of these turkey Reubens to be quite good, especially the one at Zoës Kitchen. Zoës Kitchen is a chain, mainly on the Eastern seaboard and in the South. According to its website, “Nothing is fried and there are no microwaves! What you’ll find at Zoës Kitchen is Mediterranean-inspired food, where grilling is the predominate method of cooking along with an abundance of fresh fruits and vegetables, fresh herbs, olive oil and lean proteins …” So true – everything I’ve tried at Zoës Kitchen has been fresh and tasty. I fell in love with the “Gruben” at Zoës Kitchen several months ago and finally decided to try to duplicate the recipe. 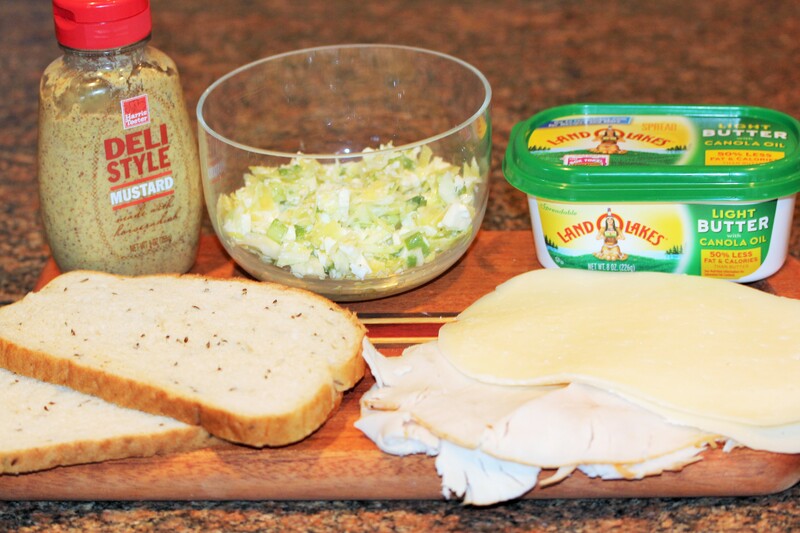 Turkey replaces corned beef, but what really makes this sandwich stand out is the marinated slaw that is used instead of the sauerkraut. 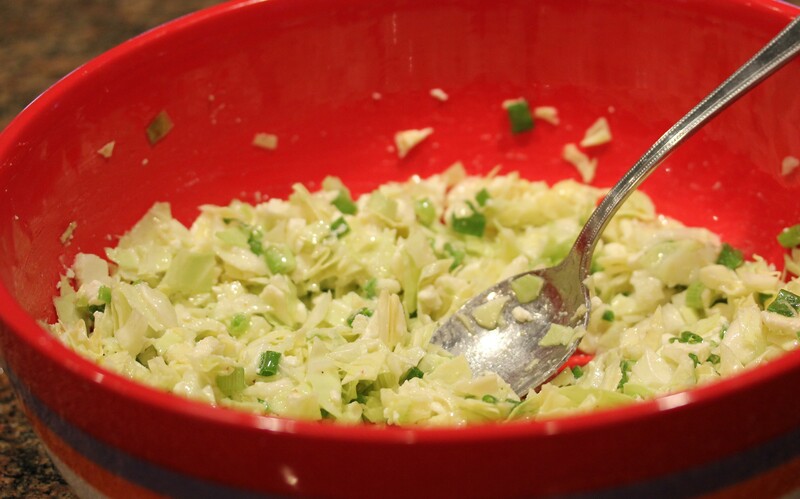 I’ve tried to duplicate Zoës’ slaw (the restaurant does not give out its recipe) and am quite pleased with my version, which is also great as a stand-alone side dish. 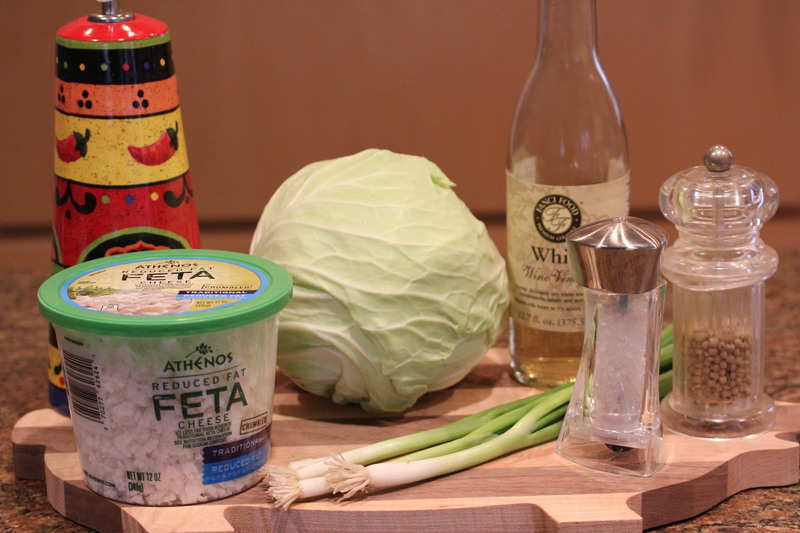 I recommend that you make the slaw several hours, or better yet, the day before you are ready to make the sandwich, so that the cabbage can marinate to enhance the overall flavor. 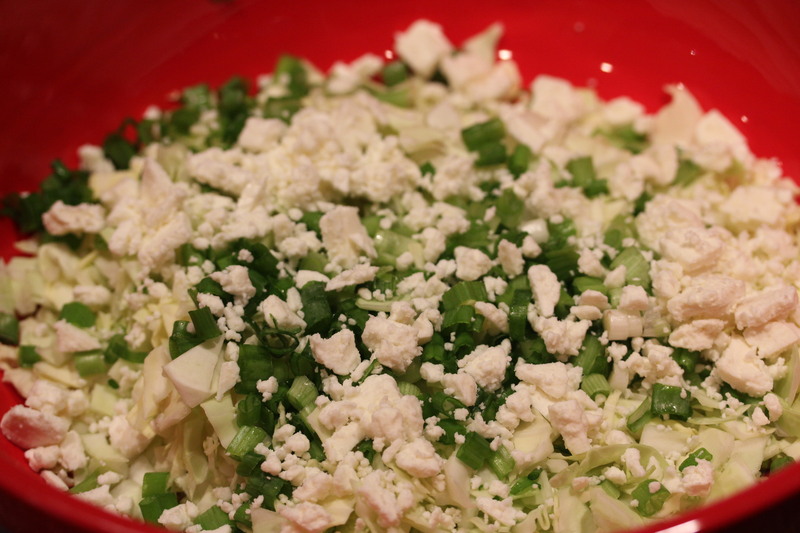 Mix cabbage, green onions and feta cheese in a large bowl. 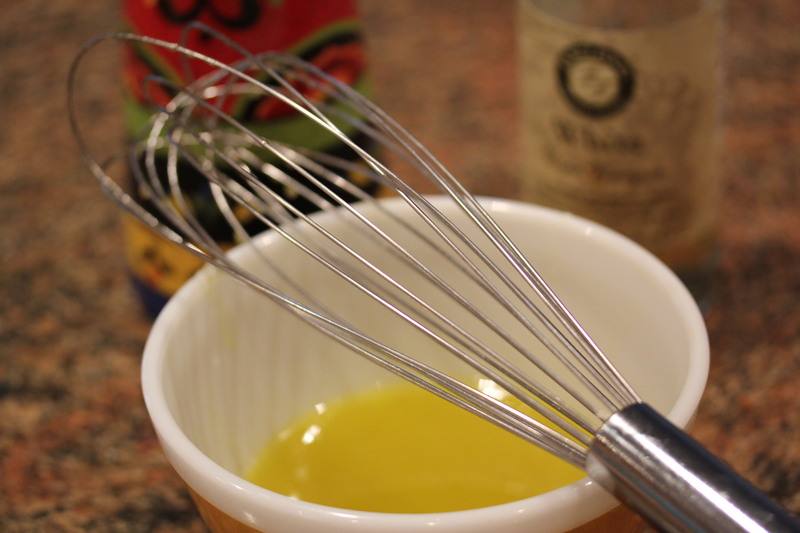 In a separate bowl, whisk together vinegar, olive oil, salt, pepper and sugar. 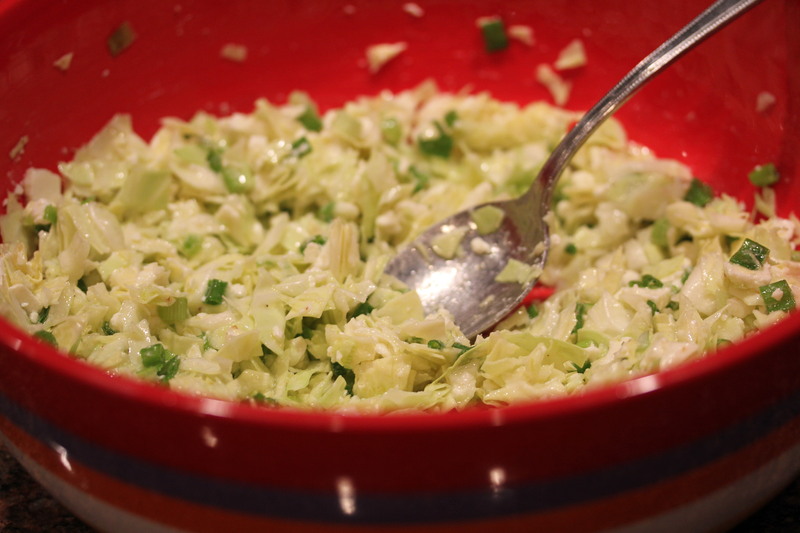 Combine with the cabbage mixture and refrigerate for several hours or overnight. 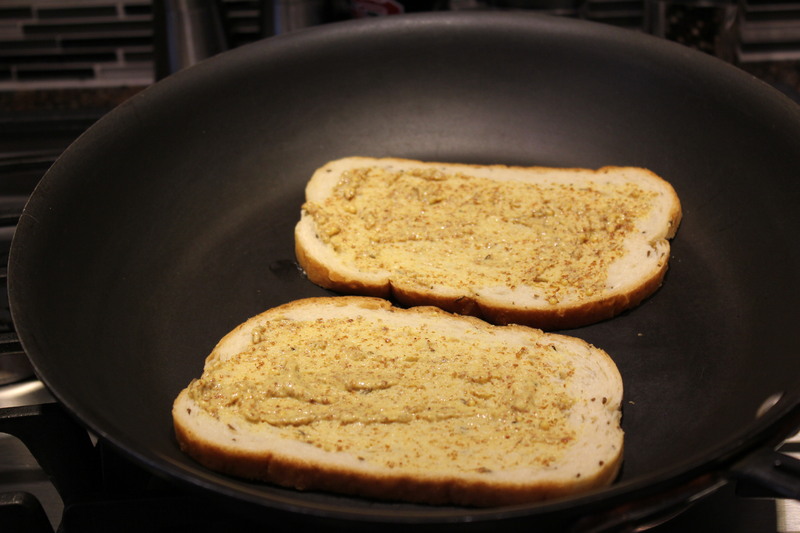 Butter the bottom of your bread slices and place them in a large skillet over medium heat. 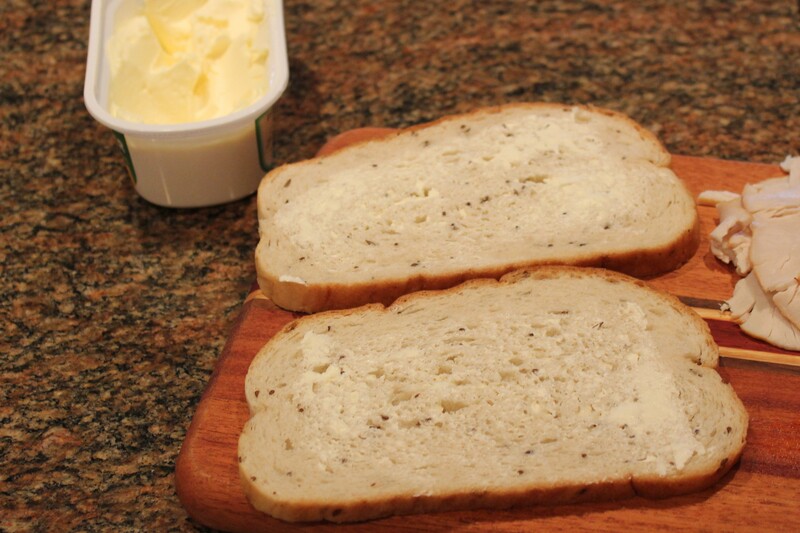 Spread the mustard on each piece of bread. 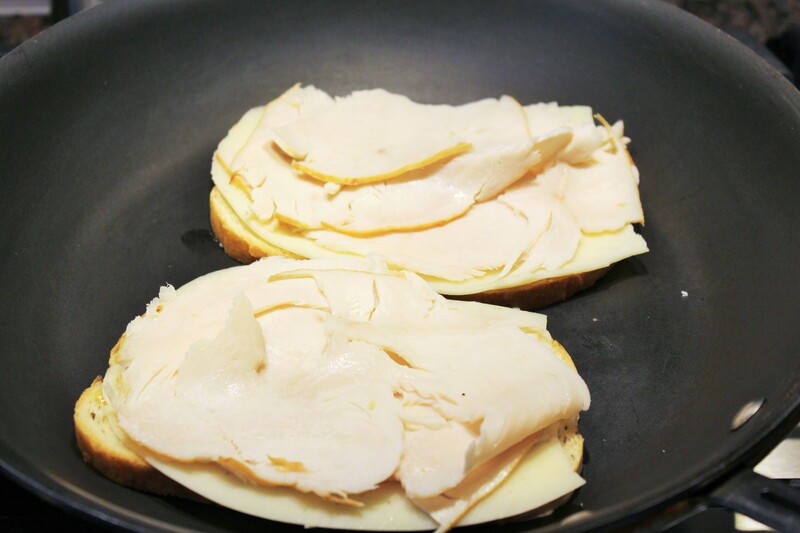 Add the cheese to each slice of bread, and then the turkey. 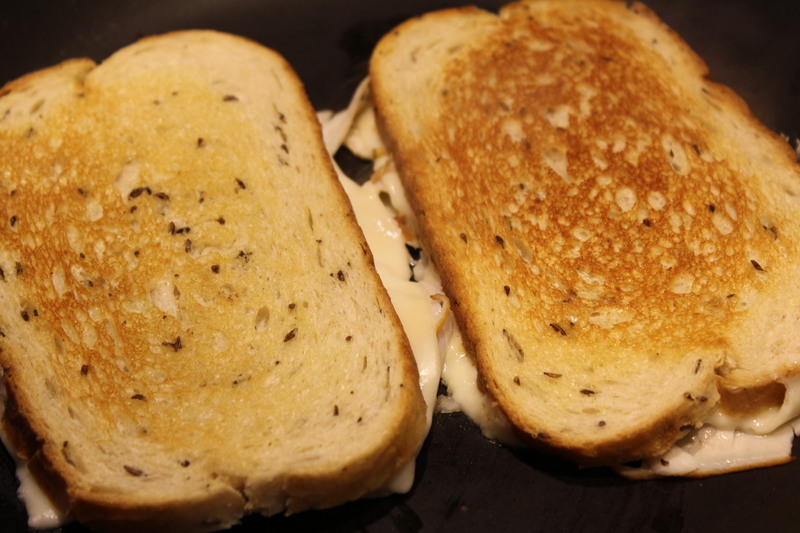 Grill until the bread starts getting brown on the bottom and the cheese starts melting. 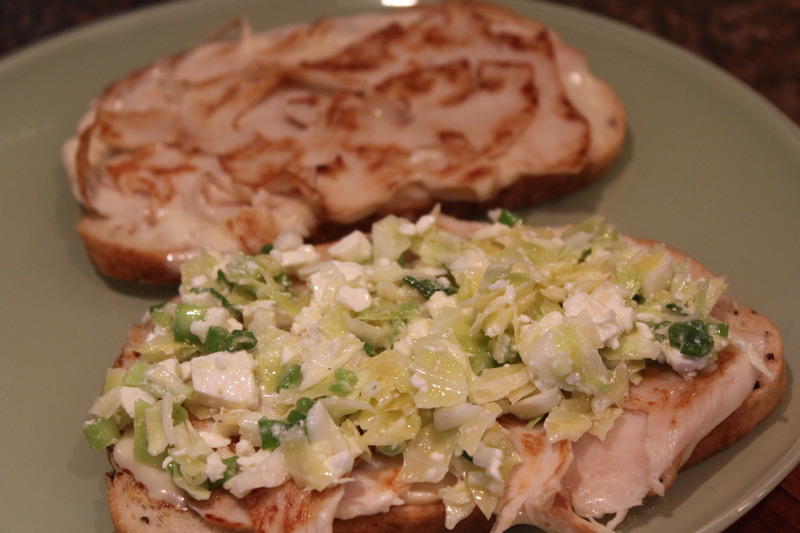 Remove each slice of bread from the skillet, top one of the pieces with a good amount of the slaw and make into a sandwich. 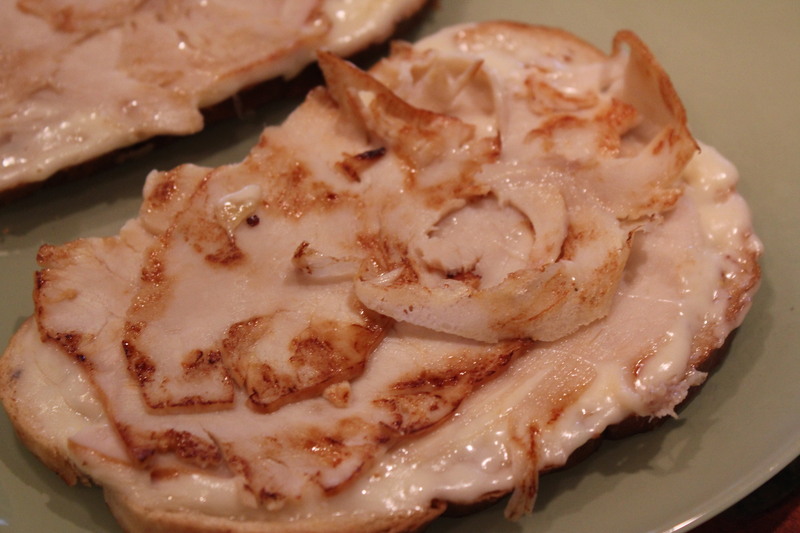 Slice in half and enjoy immediately, while the turkey and cheese are still warm. Serve with chips or fresh fruit. 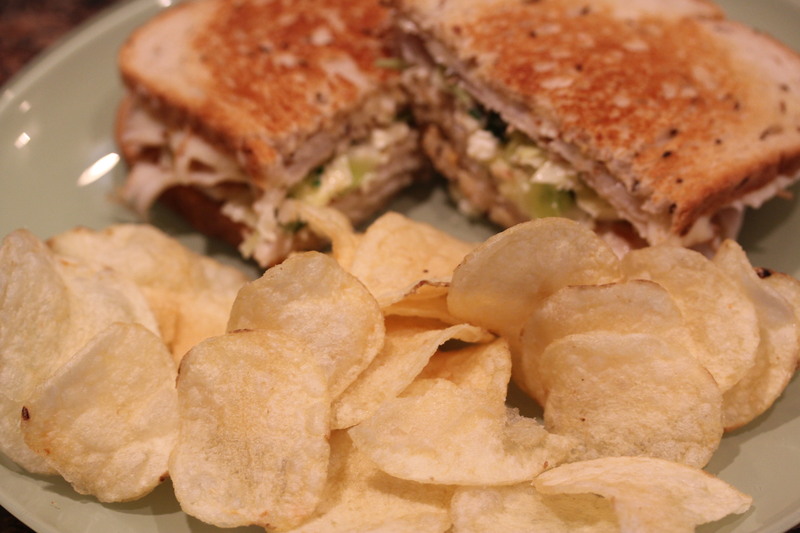 This entry was posted in Meat and Poultry, Recipes and tagged eat drink and be merry, Healthy reuben sandwich, kel's cafe recipes, Kelley Chisholm recipes, Marinated slaw with feta cheese, Turkey Reuben recipe, Zoes Kitchen Gruben sandwich copycat recipe. Bookmark the permalink.